As I mentioned in my previous post, I have made a trip to Watermelon Island in effort to detox my body to kick off my summer of raw-someness! 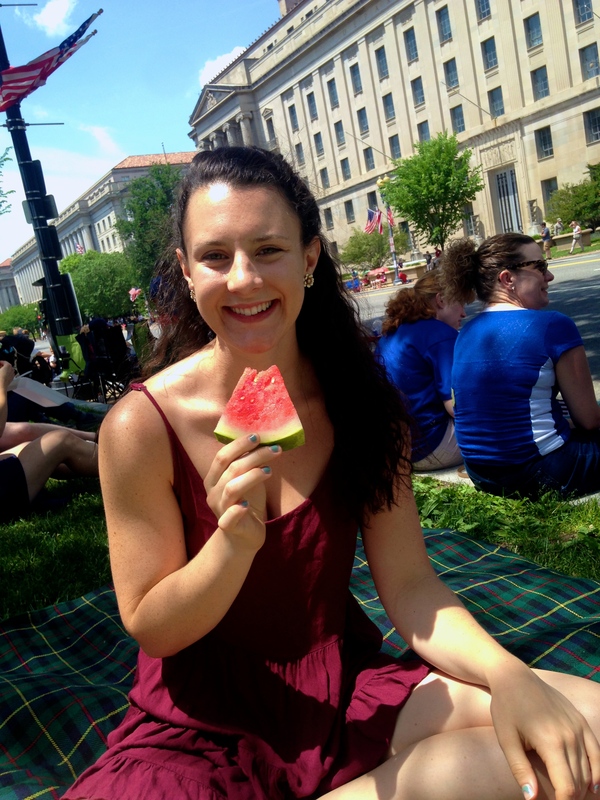 In short, I only ate watermelon during this time period, as eating just one type of fruit as a mono-meal is the absolute easiest for your body to digest. This simplicity allows it to work on others things, like flushing out any built up toxins. This time also allows for you to become more in-tune to your body’s satiation. Because you stop tasting the watermelon as vibrantly as you once did, you begin to truly rely on listening to your body to know when you’re truly satisfied. Another benefit is the aftermath of higher appreciation for the simple pleasures of other foods. I have tracked each day to give you a play-by-play on what exactly I was experiencing. I started off my morning with a nice gym session of cardio on the bike and strength training for my legs. As soon as I came home, I had my first delicious taste of watermelon. I ate about a quarter of it for breakfast, spoon and bowl style. 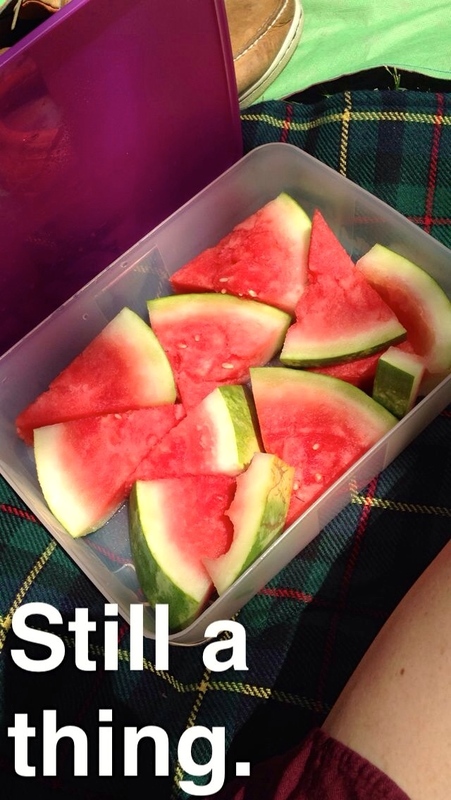 A couple hours later, I finished the entire watermelon for lunch, eating the remaining half with a spoon. Later that evening, my parents picked up pizza, my pre-vegan, favorite pizza, a true test of self-control. 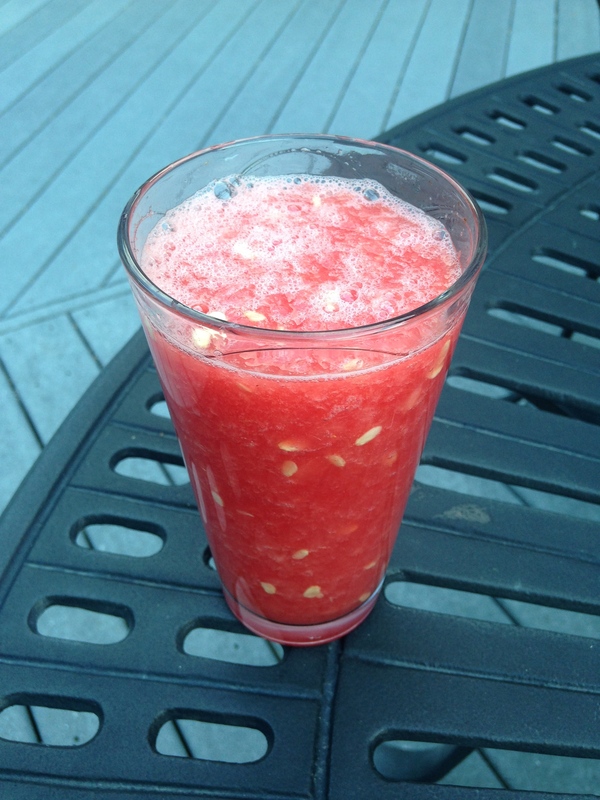 In efforts to be creative, I decided to make a watermelon slushy. I made this out of the next quarter of the second watermelon. Summary — My first day started off strong, but ended weaker than I would have liked. During breakfast and lunch, I was doing well. When it got later in the day, I couldn’t help but want something a little more hardy, with a different texture and different flavor. 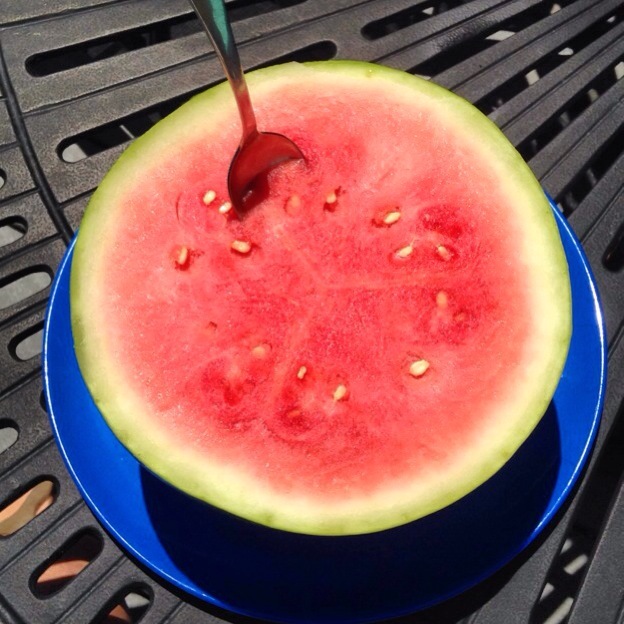 I realized that the watermelon gave me quick surges of energy that would last for about 30 minutes tops. I would then feel super low levels of energy, which I was most definitely not a fan of. My head felt cloudy, occasionally painful and I felt as though I couldn’t think clearly. I woke up feeling pretty great, although I was not thrilled knowing that my entire day would consist of watermelon again. I did notice my skin felt softer and looked very clear, even and glowing. However, I did not feel up for a workout. This did not sit well with me. I sliced up almost half a watermelon for breakfast, and spooned it out. Around noon, my family and I went to the Memorial Day Parade in Washington, D.C. for the remainder of the afternoon. I, of course, was prepped and ready to go with my watermelon. I was a little worried, as I didn’t know what type of weather/standing conditions we would be under, but it ended up being quite a relaxed atmosphere. We snagged a shady spot and sat on blankets while we enjoyed the patriotic festivities. I felt fine during this, but definitely kept myself energized snacking on watermelon every 20-30 minutes or so. When we arrived home around dinner time, I cut myself another quarter of watermelon to devour. I took a little nap and came back for another big, round slice of watermelon a couple hours before I went to bed. I noticed the times I would get up from sitting, I would feel dizzy and would see colors as I gathered my bearings and started walking. Summary — Day 2 was a bit rougher. As I began my day knowing of the low energy levels, cloudiness and headaches I would be receiving, it definitely had me more conscious of when they did come around. 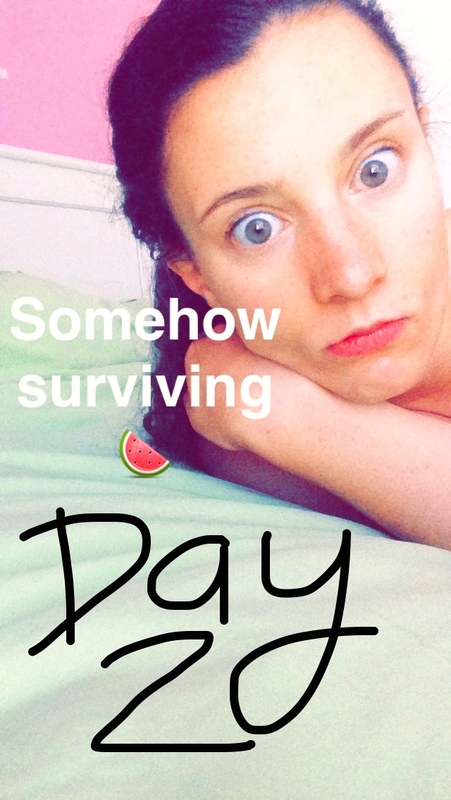 Eating watermelon alone definitely put me in a weaker, more vulnerable state — a feeling I am definitely not used to. It also seemed as though every smell of food I sensed aroused my hunger — even foods I never would be drawn to on my normal plant-based diet. And when I knew I couldn’t consume any of those amazing scents I was experiencing, it just made me want to close my eyes and sleep. Watermelon Island cancelled — I made the executive decision to end my Watermelon Island trip at breakfast on Tuesday morning, today. I understand that a detox may have you feeling more tired than normal and overall a bit different, but I just had a feeling that my body was trying to communicate with me that it didn’t like this. I applaud those I know that have done this Watermelon Island detox for as long as they have…2 weeks anyone? I know that I could physically do it, but the mental part is what is most difficult. Perhaps if I was actually on a deserted island with nothing but watermelon, but being in today’s society, living with a family that is constantly cooking and eating such flavorful, enticing foods, I just couldn’t. Now I like to think I’m a pretty self-disciplined individual, but with a mix of signals coming from my body and the knowledge that I can sustain myself just as health-consciously with a variety of other healthy, simple foods, I just couldn’t continue with the watermelon. I couldn’t bear to not have my normal energy levels, enough so that I didn’t even feel that I could work out. Problem. I am proud of myself for completing a full 48 hours on this Watermelon Island detox, and I already feel as though I am experiencing the benefits. Two days and three watermelons later, my first meal of the day off the island was breakfast — a banana, blueberry, spinach, almond milk smoothie bowl. It’s true what they say about appreciating foods so much more post-island. The flavors of the smoothie bowl seemed to dance around in my mouth, as if they too were celebrating my arrival home. If anything, I think Watermelon Island has helped me reach my goal of a smooth transition to a summer of simpler, more raw eating. It’s easier, better for you and makes your body feel fantastic, and I couldn’t be more excited for the foods that await me! All in all, I’m glad I was able to experience this Watermelon Island adventure, but from now on, I’ll be staying on my own soil.